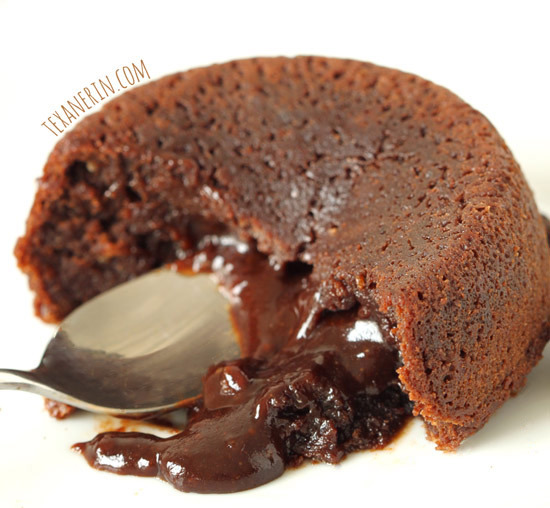 This gluten-free chocolate molten lava cake recipe makes just enough for two! Can be made with all-purpose flour or whole wheat if a gluten-free version isn’t needed. It’s also naturally dairy-free! I spent my morning looking for something slightly healthier and chocolatey to make for a Valentine’s Day post. I came across a lot of chocolate molten lava cakes, which all looked amazing, but I don’t need a stick of butter. Or a cup of sugar. It’s not like these are healthy but I cut way down on the sugar and fat. Plus I used coconut oil instead of butter and made it 100% whole grain. I also used coconut sugar instead of granulated sugar. If you don’t have coconut sugar, you can use unrefined sugar or granulated. As a bonus, these molten lava cakes are also dairy-free! I added a little bit of espresso powder because I wanted to jazz these up a little bit, but you can leave it out if you want. I also added some Frangelico, the hazelnut liqueur, just because I love it. You can replace it with whatever alcohol you fancy or vanilla. Make sure whatever alcohol you use is gluten-free, if that’s what you need. I still used the hazelnuts for decoration. It was either that or powdered sugar but since I was trying to avoid refined sugar here, I went with nuts. I’m not a fan of dark chocolate so I used semi-sweet and it was perfect. However, if you like dark chocolate – go for it! Remember when we discussed how dark chocolate and its antioxidants are gobblers in this homemade chocolate peanut butter post? 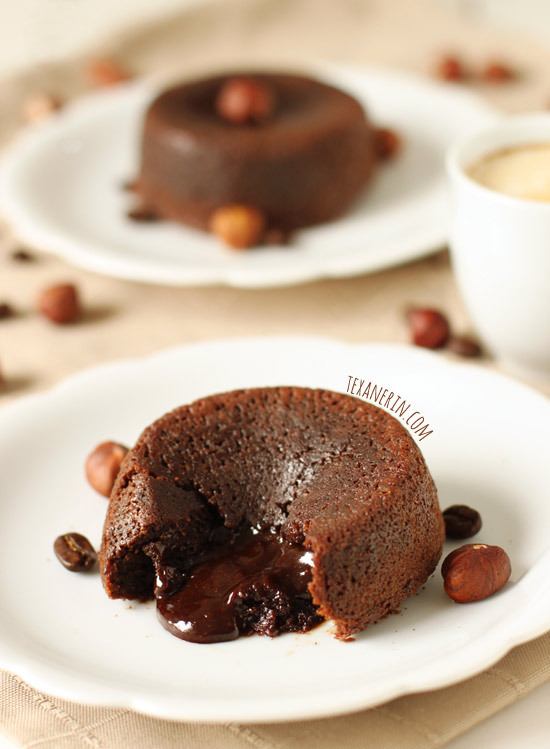 Dark chocolate would definitely boost the healthfulness of these molten lava cakes! And if you’re wondering if these gluten-free chocolate molten lava cakes taste whole grain or healthy… pssh! Look at them. They’re super rich and decadent and perfect for Valentine’s Day! Or if you’re like me – breakfast. Nothing like some antioxidant gobblers to start the day! (if I had actually used dark chocolate ;)) The ingredient list is quite short and it takes less than 20 minutes to prepare and bake. It’s like instant chocolate gratification. And finally, on my journey to find the perfect molten lava cake, I found a ton of recipes that made a large portion. These should be served while still warm and I don’t know about you, but if I have 6 or 8 of anything that’s warm, gooey and chocolatey sitting around, and I know it won’t taste as good later… I’m going to eat it ALL. That problem is avoided with this molten lava cakes for two recipe! Two servings. One for you and your best friend. Your special lover friend. Your elderly neighbor. OR! Two for yourself if you’re feelin’ naughty. If you prefer something a little different, try these white chocolate molten lava cakes! They look SO good. Preheat the oven to 350°F (176°C) and spray two 6-ounce (180ml) ramekins very well with cooking spray. In a medium bowl, mix together the sugar, egg, egg yolk, Frangelico, espresso powder and salt. Let it sit for 10 minutes. This is so the coconut sugar has a chance to dissolve. Meanwhile, melt the chocolate and coconut oil in the microwave at half power, in 30 second increments, until melted. Stir after every increment. Add the chocolate mixture to the sugar mixture and stir just until combined. Sprinkle the flour over the chocolate mixture and fold in. Do not over mix! Your cakes will be tough if you do. Only fold in until no more flour streaks remain. Pour the batter, which will be quite sticky, into the ramekins and bake for 13 minutes. The center should not longer appear wet when they're ready. Let them cool for 10 minutes in the ramekins and then flip out onto a plate. Refined coconut oil doesn't have any coconut taste. If you don't mind the coconut taste, use unrefined. 116 comments on “Gluten-free Chocolate Lava Cake (dairy-free, whole grain options)” — Add one! I made these for Valentine’s Day this year and the whole family loved them. They were super rich, we could have split them! I did use almond flour instead of buckwheat/GF flour and it was perfect. Kids are asking me to make it again already! That’s great to know that almond flour worked out well! Did you use the same amount? I’m glad that you and your family enjoyed them. :) Thanks for your feedback and sorry for just now replying! Droolworthy and perfect for Valentine’s Day! Can’t wait to make this. Can I make the batter several hours ahead, then cook right before serving? I’m so sorry for just now seeing your question! I realize I’m probably way too late but yes… that should work just fine. Sorry again! It’s been far too long since I’ve made a molten lava cake! Ice cream is ready this is happening SOON! So looking forward to giving these a try (before Valentines Day probably)! 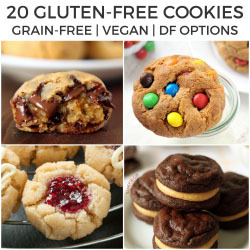 Love that they’re gluten free and can be dairy free too! YUM! I wanted to let you know I just made these for dessert for Valentine’s Day with almond flour and they turned out perfectly! They were super delicious! I also made the batter the day before, put it in the ramekins and baked them tonight. I let them come to room temp before baking. Oh, that’s awesome! Did you use 3 tablespoons of almond flour? I’ve got to try that myself! Thanks a bunch for letting me know. :) And that’s great to know that you can make the batter beforehand. What a super helpful comment. Thank you! I doubled the recipe so I would have 4 ramekins, so I used 6 tablespoons of almond flour. I also put in a little tapioca starch, but I’m not sure if it was needed. I saw on another grain free lava cake recipe they used it with the almond flour. My family wants them again soon!! Hi there! You could try using a flax egg or chia egg in place of the egg and incorporate it as you would a regular egg. I haven’t tried it but I think it’d work. Hope you’ll enjoy the cakes! We love these and have made them several times. When I made them tonight, the egg formed a rubbery layer on the bottom. Any idea why? Hmm. I have no idea why that may have happened. The only thing I could think of is that it wasn’t combined well enough. I’m happy that they worked out the other times! :) Sorry I’m not more of a help and so sorry for my slow reply! I made these over the weekend and they were SO good! Taste better than the unhealthier version, my bf even said so! I also doubled the recipe without issue. Saved a cake for the following day in the fridge, 30 seconds or so in the microwave, and it was heaven all over again. Thanks for this! I’m so happy that they came out well for you! Next time you have one of these leftover, try a bite straight from the fridge before microwaving. Then they’re like straight-up fudge. :) Thanks so much for the feedback! Oh wow. I made a double batch and baked them in a larger ramekin than what your recipe calls for. It made 3 large for hubbie, teenager and me. I only ate half of mine, my teenager ate his and the rest of mine… without my permission!!!!! That was pretty rude since I was looking forward to the rest later on. These were delicious and hit that chocolate sweet spot. Thanks Erin, you rock!!! Hahaha. I’m happy you and your teenager liked them so much! And that’s awesome that they came out well in larger ramekins. My friend made these and refrigerated her leftover cake and said it was like fudge straight from the refrigerator. Just in case you want to make them again one day and your son doesn’t steal your lefttovers. ;) Thanks so much for the nice comment and feedback! Can I make these in 2 muffin tins since I don’t have any ramekins ? Can you use agave or honey instead? If so how much? I want to make these today! Wow, those small portions of lava cakes look really tempting to try and make. I first tasted these in Australia but they were in a dark chocolate cupcake version which had milk chocolate and caramel bars in the middle. My sister and my mother made the same type/version when we got back from our vacation there. This was before I discovered I was dairy intolerant. So I was really glad I stumbled across your site and this recipe as I’d also been wondering what they were called. Wow. With caramel bars inside? That sounds decadent. :) I hope you’ll enjoy this dairy-free version as much as the ones you had in Australia! And about your dairy-free lemon curd comment in the lemon cookies post, I’m not sure I understand. Are you saying that they have DF lemon curd everywhere or are you asking me where to find DF lemon curd in Switzerland? Either way, here is a recipe for DF lemon curd. :) I hope that helps! Thanks for the recipe, i followed your recipe exactly as it said but my lava cake didn’t turn good, it doesn’t have that lava liquidly chocolate in the middle, it is baked all in the centre, just like regular chocolate cake! Could you help me if there is any tip? Oh no! Sorry to hear that. If it came out fully baked, it could be that your oven is off. Could you put a thermometer in there next time you have it on to test it? If it’s off, that could explain why it came out overdone. Also, which type of flour did you use? I’ve had a few friends make this recipe and they haven’t had any issues so other than the oven, I can’t really think of what it may be. Unless you really overbeat the batter. I hope that helps! I used whole spelt flour, i think you are right it might be my oven,cause it was a hot day i didn’t want to make it any hotter so i used my small convection oven, i will check the temperature and bake an other one :), i will let you know. Woah… 0_0 This is definitely one of the easier desserts I’ve found. I was just wondering if I can swap the coconut oil for olive oil? Would that make it taste funny? Thanks! I’ve just realized a grand mistake: I have no mixer. As such, I have to manually use a pair of chopsticks to stir the batter. Any idea how long I might need to stir? Some of the egg whites aren’t mixing. Haha. Chopsticks? :) I think a fork would work out better for you! Or a spoon. Or a spatula. I didn’t use a hand mixer either. I think I just used a silicone spatula. I hope they come out well! And it should only take maybe 20 seconds. Just found your site, love your recipes/ ideas, would it be possible to include nutritional info, it would be a great help, have a great day, thank you! Oh my gosh, I am am in love with your recipes! I have updated many baked good recipes to make them healthier, But my general rule of thumb is that dessert still has to taste like dessert. I have made Martha Stewarts molten lava recipe for dinner parties (no leftovers :) But a recipe for two is sheer genius! And all white whole wheat besides…I can’t wait until after Lent to give them a try, and your Irish cream brownies and…. That’s my rule, too! Desserts should taste like desserts and not cardboardy and healthy. ;) I hope that you’ll love these and the brownies! Let me know how they come out. :) And I’ll remember the Martha Stewart recipe for the next time I have guests! Thanks for the tip. Very smart to make this recipe for only two servings! If it made more I’m sure I’d eat them all–they look SO good! Thanks, Lauren! And yeah. I did NOT need 6 or 8 of these just sitting around in the kitchen. I would have eaten them all! WOW, this look amazing! I have been informed by my husband that I need to make these for us asap lol! And what beautiful photos. Can’t wait to try it! Yay, I love this healthier version of my absolute favorite dessert! These look AWESOME! And so rich… you got yours to come out of the dish perfectly too. Props to you friend because that is no small feat. My are always a hot mess. I made these for Valentines and subbed ‘flax eggs’ for the real eggs and it turned out well. Probably not quite as cakey on the outside but done enough to slip out of the ramekins and gooey enough on the inside to be delicious! Topped it with whipped coconut cream and we were in Himmel! I used the virgin coconut oil with amaretto and it was fantastic. Have made this,recipe twice in the last 3 days. Thanks! While I do love a good stick of butter, these look every bit as delicious as the traditional version! Gorgeous gooey photos! I saw a few questions about spelt; perhaps I can answer them. Spelt is an ancient wheat that has not been hybridized. Generally speaking it has a more fragile gluten and a more mild taste than wheat. It is available from Purity Foods as Vita Spelt (both organic and conventional) and is available in white as well as whole flour. I have had carrot cakes and chocolate cakes done with whole spelt flour and they are amazing and we have a large customer who makes organic pies who uses our organic white spelt flour for the crusts. Your baked items are taken to a higher level when you choose spelt. See for yourself. When my wife started to make pies out of white spelt flour I had to finally ask her to stop. Thanks for the info, Don! I love my spelt. :) Luckily it’s readily available over here and as cheap as whole wheat. So I find myself using it all the time! I’ve had this recipe opened in a tab all week and can’t wait to make them. They’re calling my name! I was so excited when I saw the pic of these on instagram and I’m so glad you posted the recipe here; they look amazing and truly decadent without being too over the top. I do not have dairy chocolate chips on hand. Could I substitute with baking chocolate? I jus tried the recipe. Yes! The magic has happened jus like you said it would. It’s come out really well. These look an sound amazing! Chocolate has become a symbol of St. Valentine`s Day! This recipe is a perfect desert for a romantic dinner with your boyfriend or husband. What inspired you to bake exactly this desert? Erin replies to Maria G.
Here coconut oil is unavailable please suggest what other alternative can b used? I have made lava cakes before, but went the butter route :) Love this option though for next time. I always just make 1 or 2 and freeze the batter for next time, because I would eat all 6 in one sitting if I didn’t! Hi Erin.. Will this cake bake well without adding baking powder or baking soda?? How will the outside be baked and the inside be molten if we mix all the ingredients together?? I wanna try but I dont wanna mess with it. Hi, Sharon! Yes, it absolutely doesn’t need baking powder or baking soda. These cakes don’t actually rise at all and they shouldn’t. :) And I don’t know how to answer your second question – I guess it’s just magic? ;) I’ve made lots of pudding cakes and similar goodies where you mix everything together and it just separates when baking. I think it has something to do with the sugar content but I’m not positive! Just follow the recipe and you’ll be fine. :) I hope you’ll enjoy them! You can freeze the batter?! Genius! Oh my gosh, IN LOVE!!! The melty chocolate has my heart. Can these be made with almond flour? They look so yummy I can’t wait to make them. I haven’t tried it so I can’t really say. :( Sorry! I think it would because it’s such a small amount but I’m not positive. Do you need it to be grain-free or would gluten-free do? Because a gluten-free baking mix should work well! Thanks, Christina! :) I was so giddy when these actually came out. Didn’t think a healthier version would be possible! They look wonderful! These pictures are so tempting! I love everything you have done with these – smaller portions, healthier but loaded with delicious, and of course melty-oooey-gooey chocolate!! You know how I love hazelnuts and chocolate, so this special healthier treat is right up my alley. Really like how this recipe is also dairy free. Thank you, Erin. :) Pinning! 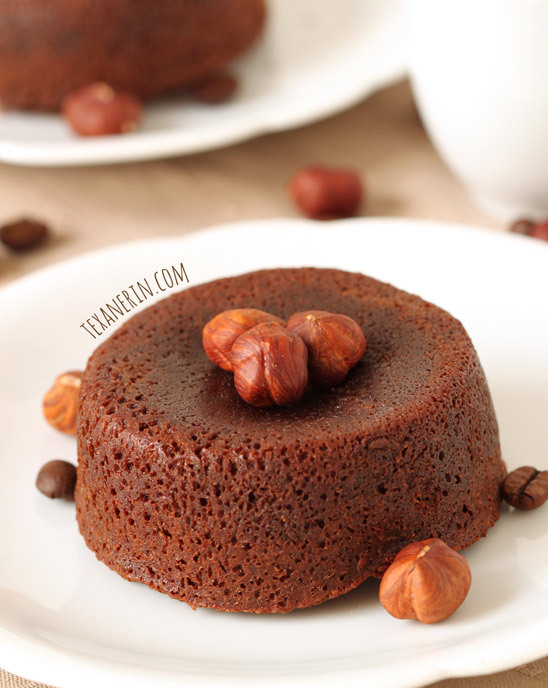 Love this healthier spin on lava cakes, these are definitely one of my favourites! I WILL be trying these today! I was looking for a recipe like this yesterday! Just recently became intolerant to dairy and was hoping for a molten chocolate cake to make for date night. But, like you said, all the recipes I could find called for a stick of butter. I am so excited to make this! I hope you’ll be able to make these for the next date night! (make sure to get the dairy-free chocolate chips!) Good luck and enjoy. :D Let me know how they come out! I seriously need this as much as I love lava cakes! Healthy ones would be right up my alley! I have only recently started using whole grain flours other than wheat. I have spelt and oat but would like to know more about their properties. When a recipe calls for whole wheat or spelt, does one give a better texture than another. Which do you prefer for the molten lava cakes. Btw, I am definitely making these! These look delish! 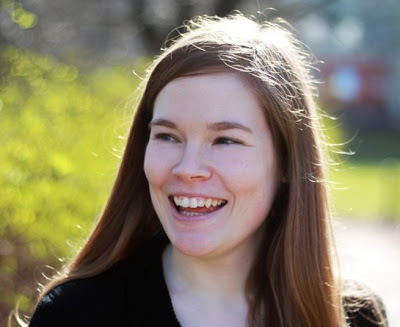 first time reading your blog, and I look forward to reading more! Can you tell me though — is this one product: “white whole wheat whole spelt flour” or did you mean I could choose between white, whole wheat, whole spelt flour? I’ve not used spelt so please elaborate. thanks! I am definitely into these – so much goodness! !